The Gardens has launched an exciting new project that has been strongly supported and assisted by the Friends. 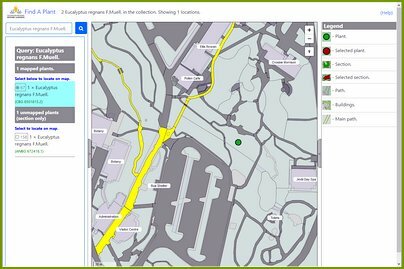 The Find a Plant application (FAP) will help visitors, staff and researchers to locate specific plants growing in the Gardens. The application will show all plants that are in publicly accessible sections. The data displayed is linked to the Living Collections system. Gardens staff regularly maintain the records on which this application is based. However, this is a huge task and while staff try to keep the data current, there will be occasions when plants are no longer in the ground where expected, or they have been recently planted and the records have not caught up. The current app is intended to be only stage 1, with a possible later stage to add more information, additional ways to search, and photos of the plants. To find the app go to https://www.anbg.gov.au/fap There will also be information on the Gardens website about the application, and guidance should be available at the Gardens Visitor Centre.